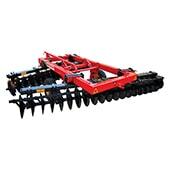 Heavy type Wide Offset Disc Harrows are trailed type on two wheel. 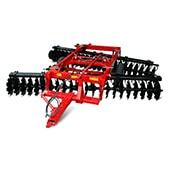 It can be easily transported to field. 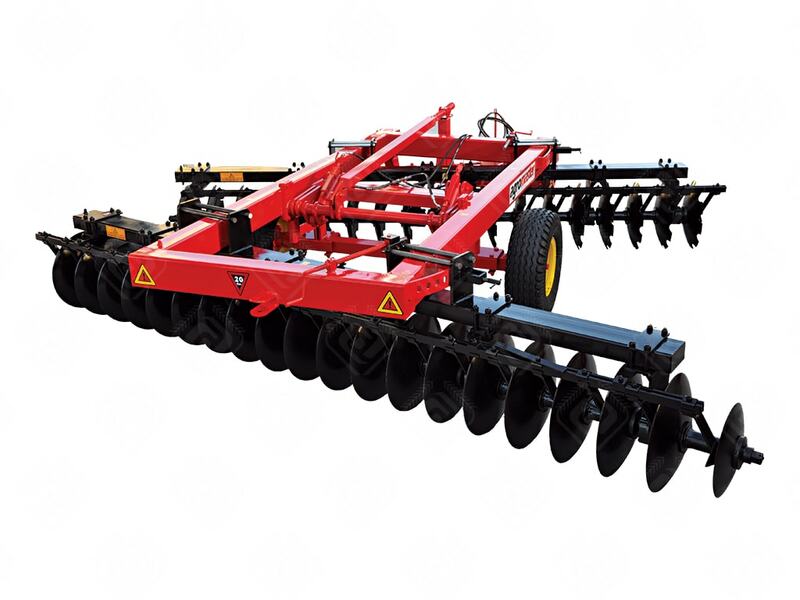 Trailed type wide offset disc harrow moved by hydraulic system for transport and deepth adjustment.Heavy type Wide Trailed off set disc harrow with hydraulic lifting system is used for breaking clods and mixing soils to make seed bed. 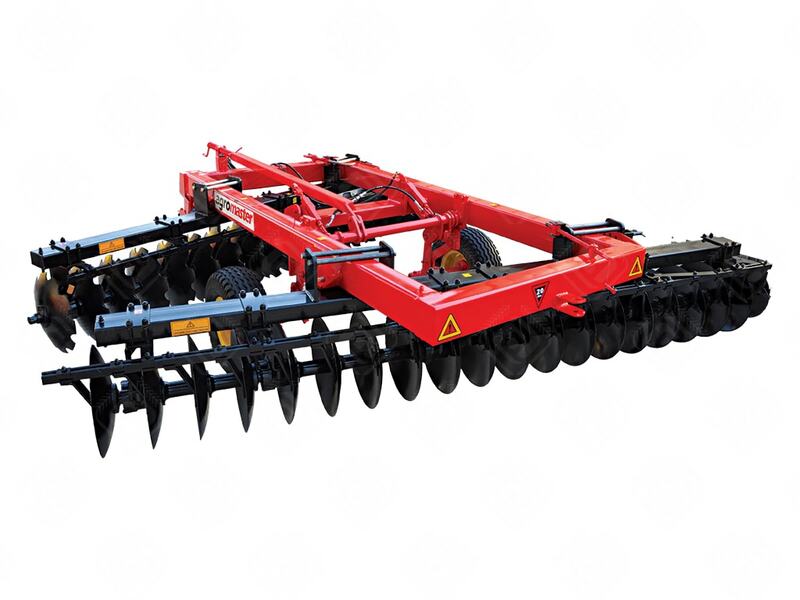 Also it can be used for chopping of weeds and stems, breaking of plant stubbles (such as sunflower, maize, cotton, wheat and etc.) 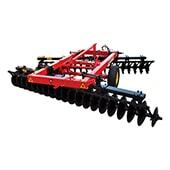 mixing with soil after harvesting and it help to obtaine a kind of organic fertilizer.This kind of disc harrow can work very easily in wet soils and according to the soil conditions it can be used instead of plough. Battery angle can be arranged till 20-22 degree. Tires moved standard level and easily adjusted the working depth by means of the axle mechanism on the tire. 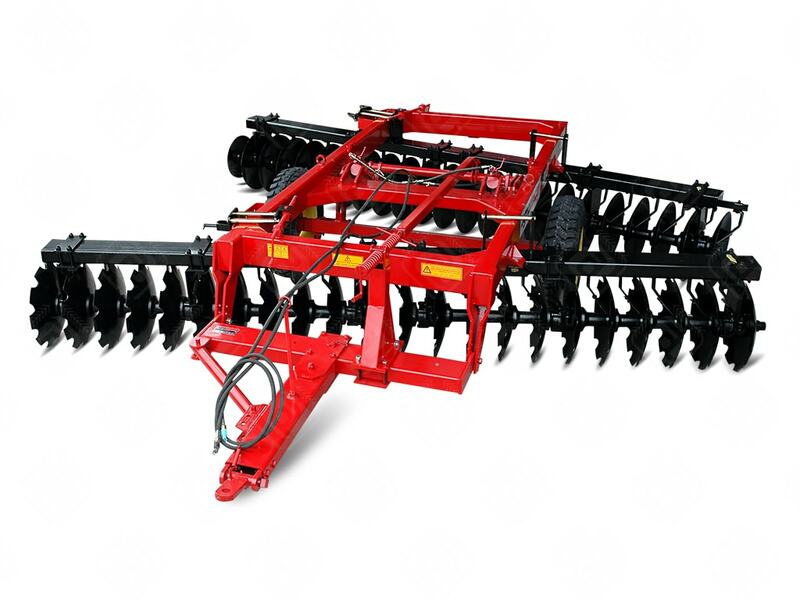 After harvesting, in dry months this disc harrow can be used for preparing the soils directly to sow up to 27,5 cm depending disc size used.Size of frame for this model is 200×200 mm and The number of discs is between 16-42 disc with sizes ; 560/610/660 and 710 mm high quality 52 HRC bororn steel.It has been used house bearings with conical bearings one side and ball bearing other side with high quality seals. It can be greaseable. ft.in. 7'4" 8'9" 8'10" 9'9" 10'3"
ft.in. 3'8" 3'8" 3'8" 3'8" 3'8"
ft.in 8"-4" 8"-4" 8"-4" 8"-4" 8"-4"
ft.in. 10'11" 11'8" 12'5" 13'1" 14'9" 16'5"
ft.in 5'7" 5'7" 5'7" 5'7" 5'7" 5'7"
ft.in 13'1" 13'1" 13'1" 13'1" 13'1" 13'1"
ft.in 4'3" 4'3" 4'3" 4'3" 4'3" 4'3"
ft.in. 3'8" 3'8" 3'8" 3'8" 3'8" 3'8"
ft.in. 8"-9" 8"-9" 8"-9" 8"-9" 8"-9" 8"-9"
ft.in. 22"-11/64" 22"-11/64" 22"-11/64" 22"-11/64" 22"-11/64" 22"-11/64"
ft.in. 24"-13/64" 24"-13/64" 24"-13/64" 24"-13/64" 24"-13/64" 24"-13/64"
ft.in 9" 9" 9" 9" 9" 9"
ft.in 8"-4" 8"-4" 8"-4" 8"-4" 8"-4" 8"-4"
ft.in. 8'2" 9' 9'10" 10'8" 11'6"